As in crossbreeding, in Australian Fullblood feeder production there is no public domain, national carcass database to enable precise performance ranking of locally-available sires, even including first generation AI sires imported from Japan well over a decade ago. There is the same low probability that such a database will ever become available, due to proprietary, competitive pressures. And as in the XB industry, prior to the recent GEBV initiative, Fullblood carcass data generally has been available only to producer/suppliers from feedlotter/processors, who provide synopsis data. 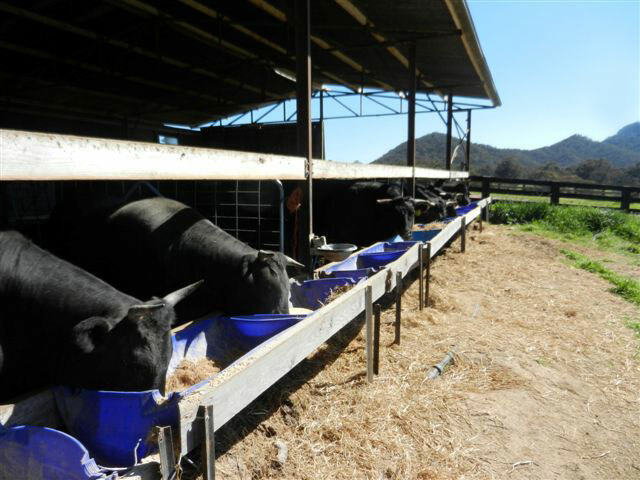 In 2015, major feeders such as AACo now run entirely in-house EBV and genetics management programs, but have in the past provided substantial carcass data. Others, such as Blackmore Wagyu, have withdrawn from the on-line AWA database. Major feeders of Fullbloods that continue to contribute to AWA carcass data collection include Mayura Station and Macquarie Downs, with many smaller feeder producers. Mechanisms for incorporating feedlot carcass data were under investigation in early 2015. The first limited ‘public showing’ of progeny carcasses of Australian fine marbling fullblood sires commenced from the 2011-2012 ‘Beyond BMS 9’ sessions at AWA AGMs, which identified a short list from Australian FB carcass images captured during the preceding year, using the Japanese digital imaging technology currently employed in carcass EBV research. Progress research EBVs were previewed at the AWA Wagyu conferences in 2013 and an initial Research Sire/Dam Summary published in 2014. New GEBVs – combining existing Wagyu EBV data with the new research values based on carcass image data – are expected in 2015. Details from the original announcement of the new generation EBV are available in the AWA Update Magazine #48, here. An impressive potential outcome of the genomic project is the possibility of a test to predict the performance of young Wagyu – representing substantial savings in time and risk. Dr Banks discussed this, and the entire project, with Beef Central journalist Jon Condon, here.